No matter how carefully we use our computer, we always end up getting our system infected for various reasons. Be it downloading movies from untrusted websites or clicking on ads. It not only makes our computer slow and sluggish but also causes other problems as well. Most of us often wonder how to fix it or diagnose the system? Well, you can download any software of your choice to deal with the issue. However, you can do it manually as well, but downloading a softwares the easiest and quickest way to check health of your Windows computer. 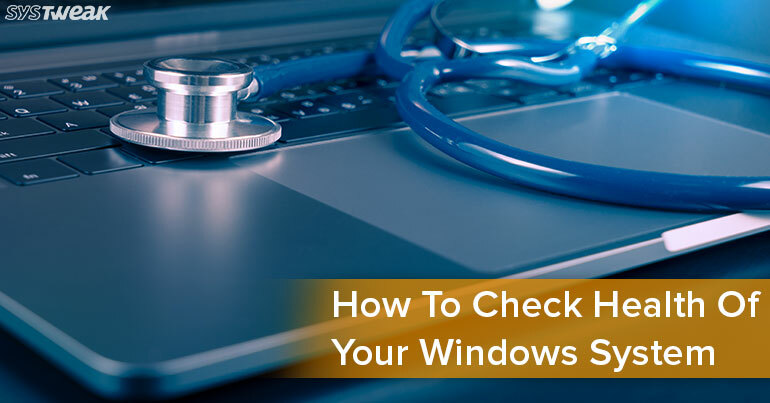 In this post, we’ve selected a few software to help you check the health of your Windows System in almost every category. So, here we go! With over 600,000 users across the globe, ClamWin is a secure way to track the health of your computer. Moreover, it is a free Antivirus program that does everything that it claims. In fact, it is a reliable software you can rely on, to manage your computer’s health. ClamWin is a suitable tool for malware diagnostics for Microsoft Windows 10, 8, 7, Vista, XP, 2000, 98 & Windows Server 2003, 2008 and 2012. It is a user-centric software, which is designed to make your life easier. The tool can easily detect high detection rates for virus, malware and spyware. It automatically updates virus database. This is an ultimate tool that comes with an amazing feature called scanning scheduler. WinDirStat is second on our list and is an incredible yet powerful program that is capable of displaying your disk usage statistics. It is a wonderful tool that helps you clean up numerous versions of Windows computer be it Windows 10 or Windows 8. Like other tools, WinDirStat also easily and quickly reads extension list. The tool displays information of how much space each extension has occupied. It has provided color codes for each extension on the drive for your better understanding. It is possible to zoom into a color-coded block with zoom features and to get rid of unwanted files. CPU-Z is developed by CPUID, which is available for free of cost. It is considered as one of the best ways to check health of your Windows system. CPU-Z is a tracking, profiling and monitoring app suitable for Microsoft Windows and Android. It focuses on the hardware parts of the computer such as CPU, RAM and motherboard chipset. Once the tool is done with the scanning process, the app provides all the required information in just one window. It is PC based version but if you’ll open the app, you will get the Android version too. It gathers information of some components of your system such as Mainboard and chipset. You will get additional information like size, timings, memory type, and module specification (SPD). The app also supports real-time measurement of every single core’s internal and memory frequency. Reliability Monitor is an inherent feature that is available on Windows computer. You can swiftly access this mind-blowing feature on your Windows 10, Windows 7, and Windows Vista. It is one of the best ways to view the stability history of your machine. The tool displays the entire brief history of your computer along with a timeline errors and events that came up earlier. Reliability Monitor has a lot more to offer you then tracking down prior alerts and warnings such as past critical. It is a free and inbuilt feature for Windows Users. Reliability Monitor displays the entire info in one window, which is named as ‘Review your computer’s reliability and problem history”. It allows you check out the prior info based on dates as well. The tool supports stability index that evaluates your computer’s stability on a scale of 1 to 10. If you’re looking for a software that effectively detects and removes malware, adware, and rootkit, then SpyHunter is just for you. This tool is designed to make sure your computer is safe and secure from viruses and other malicious threats. It is an advanced technology that is one step ahead from malicious attackers to make sure stored information is secured in your PC. The tool comes with tons of other features as well such as personalization and customization. SpyHunter is a reliable tool to hunt down the malevolent threats and fulfill other requirements too. It is totally worth to give a try. It has a user-friendly interface which can be used by any age group. It is a Malware Detection & Removal software that comes with one-on-one customer support. SpyHunter exposes and eliminates the virus, ransomware, spyware, keyloggers, rootkits, trojans, adware, worms, etc. This intuitive tool comes with easy to use interface that has a lot more to offer you other than an intelligent automatic update. So, we’ve listed the best software to check the health of your Windows System with ease. If you think any other software that also deserves to be part of above list, then feel free to let us know in the below comments box.